I live in a world of contradiction. Take today for instance; I was really throwing myself a party because I had made the adult decision to actually fill my gas tank. Like full. I kind of hate the act of getting gas; I don’t know what it is. The standing? The waiting? I just feel like there are a hundred better things I could be doing with my time and feel a grudge against my very car for needing fuel to sustain. I’ll fidget impatiently and settle for a tank that is a quarter-full rather than just bucking up and getting over myself. This then turns into me having to go to the gas station more, which is really ironic now that I’m thinking about it. Anyways I was feeling pretty great about my life and the direction it was headed, until I realized I was tired and sleepy and needed food if I was feasibly going to make it through the rest of my rainy Sunday. I then stumbled upon a horrible realization: my cupboards were bare. As far as I was concerned I had two choices, I could a.) Continue my very adult day and go on a much needed run to the grocery store or b.) I could go into the gas station and see what their entrée of the day was. So that’s where I find myself, writing these words and eating gas station Macaroni & Cheese straight out of the pot – because why bother dirtying another dish? And I’m pretty proud of myself because it turned out really good, but then I have to remind myself that my “cooking” included making noodles and then putting powder on them so there’s that. I wish I could go back in time to know what a younger version of myself pictured what I would be doing at this point in time on my life continuum. I’m not sure I thought about my future much as a kid and I don’t mean that in any kind of morose way. I just have never been a person who fantasized about what they would be doing when or really set goals or dreams for the future. While this may sound lazy, I assure you I’m not. I just think that organically I am built to be a person who lives day-to-day, and that’s a reality I’m fine with. It’s not to say I don’t have things I would like to happen (maybe met a young broad whose not a polyamorous lesbian, straight, or a globe trotter) but truly and selfishly, I am the center of my world. And if I am happy my universe is good, and if I am making other people happy – which I think I do a fair amount of? That’s even better. Maybe I’ll never own a house, or have a car better than a beater. Maybe I’ll move back and forth between the East and West Coast because I can’t make up my mind. Maybe I’ll be a spinster and you’ll see me on ‘Hoarders’ where they uncover seventeen tiny cat skeletons and my adult diapers. Perhaps I’ll find a partner in crime to share my adventures with or maybe I’m meant for a solo-trip this time around. Who knows? That’s the beauty of it and something I’ve come to accept and know. As this journey unfolds all I can do is appreciate the weirdness and continue to live with integrity and greet my missteps with a smile and compassion. 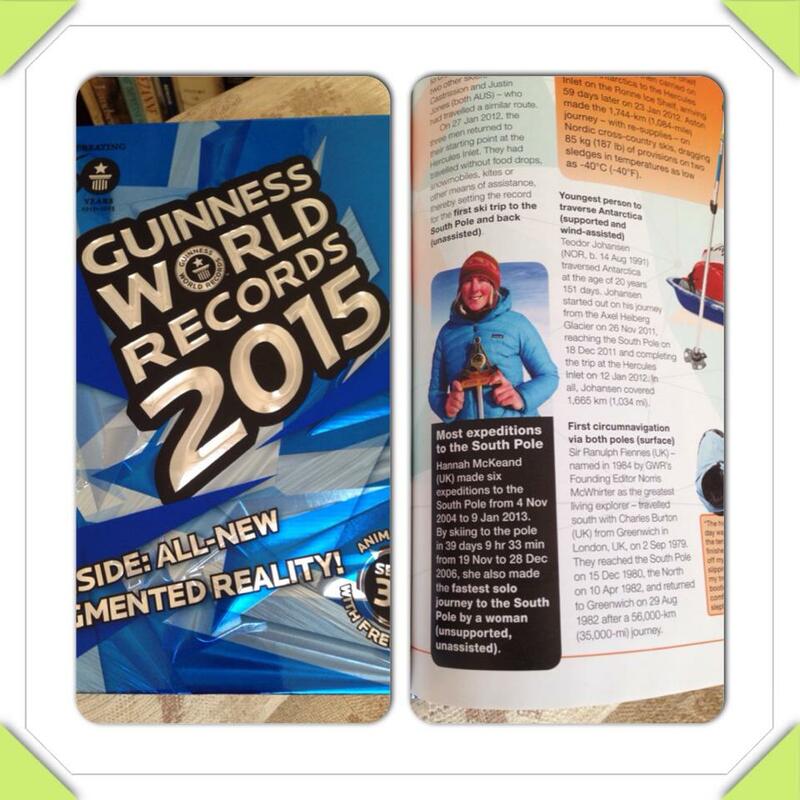 Just casual World Records, NBD Hannah. I house and dog sat for my wonderful neighbor Hannah this weekend, an experience that was very adult. I always tell Hannah that “I want to be her when I grow up,” which I think embarrasses her. And I’m not even referring to the fact that this chick made it into the Guinness Book of World Records not once – but twice this year. For both the fastest solo journey to the South Pole by a woman and for making six expeditions there between 2004-2013. Antarctic adventures aside, I enjoy staying at her house because I can play make believe and pretend that I have this lovely backyard for entertaining my guests, appliances that are all functioning normally, and nice things that she probably bought brand new – like an adult. The newest addition is a stunning built in bookcase that I would figuratively fill with all my leather-bound books and journals. Hannah told me once that when she put a bookshelf in there, that’s when she knew she’d really made it but reported feeling no more adult post-fabrication of said bookshelf. I guess we’ve both got some more growing to do. 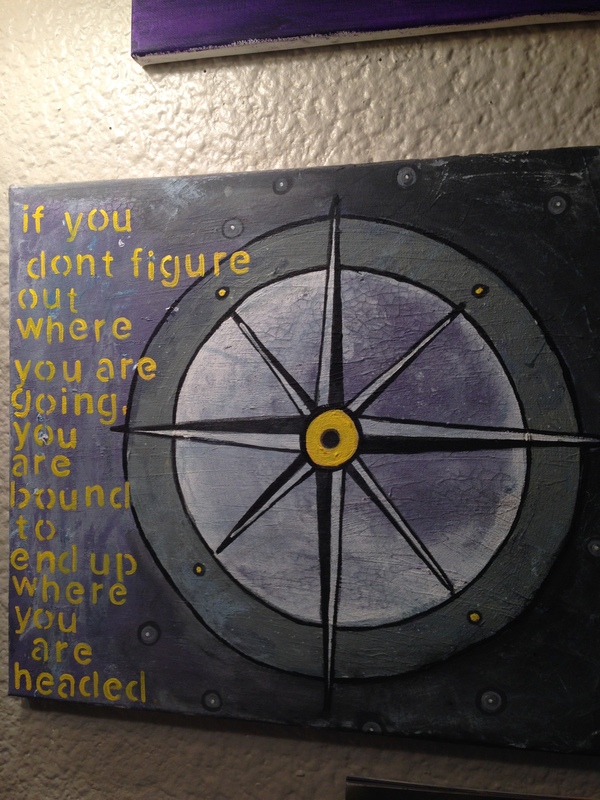 I have a painting I did several years ago that featured two things. The first was a compass. 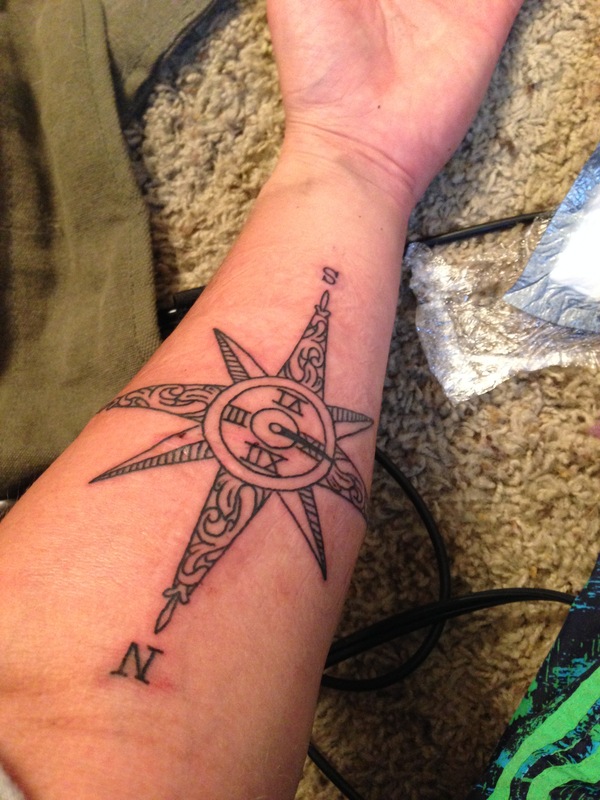 I’ve always loved the symbology behind the compass, partially because I’m sort of directionless and also because I am just a mere muse to whatever my life’s path is setup to be. I also painted an old Chinese Proverb to the left of the compass that simply said: “If you don’t know where you are going, you’re bound to end up where you are headed.” I promised myself when I truly believed that I would get that compass tattooed somewhere on my body. Give me a break, this just happened. Now if you’ll excuse me, I’ve got some gas station Macaroni and Cheese that needs eating. Posted in Uncategorized.Tagged 20's, adulthood, being an adult, compass, gay, hannah mckeand, self-compassion, surviving your twenties, tattoo, weird.